￼A Leave and Licence agreement is a document that bestows the Licensee with the permission to occupy the Licensor’s property. Hence the occupancy is granted on Leave and Licence basis and not on tenancy basis. Such an agreement makes eviction easier and is general provides the landlord with greater power. Leave and Licence agreement is different from leases as leases create an interest in property whereas the former does not. Also, leases are transferable which is not the case in a Leave and Licence agreement. As per the Indian law, a “Licence” is a right granted by one person to another person or a group of people. Such rights usually concern actions performed in or upon immovable property, actions which would seem unlawful otherwise. Licence grants personal rights and such rights are not transferable. Licensor is the person who grants the Licence and a Licensee is the person who pays for the Licence and enjoys the rights. Licences must not be confused with leases or rental agreements as they are each different in their own aspects. A popular choice among landlords, the Leave and Licence agreement has the following properties. How To Make A Leave And Licence Agreement Legally Valid? Once you have prepared the content of the deed, print it on stamp paper of required value. The licensor and the licensee must then place their signatures in the designated places along with the signatures of two (2) witnesses. 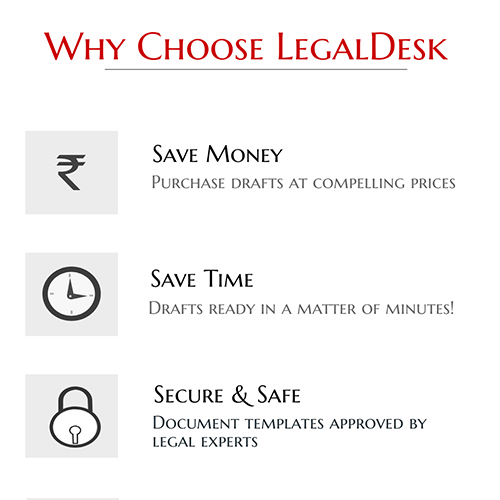 We have a lawyer verified, pre-drafted template using which you can create a Leave And Licence agreement in a matter of minutes. We also have the feature to print it on stamp paper and deliver it to an address of your choice! Do give it a shot. 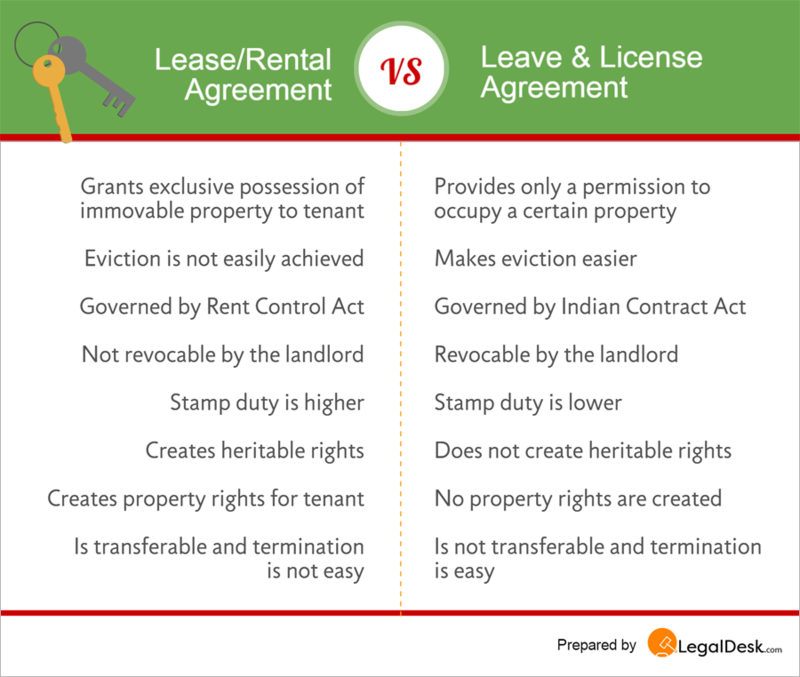 Following are the common differences between a lease (commonly referred as rental agreement) and a Leave and Licence agreement. At this point, we’d like to state that this particular deed favours the owner and not the tenant. Don’t get us wrong, this deed does not Leave the tenant exposed or vulnerable, it just favours the landlord by a certain margin, that’s all. The Leave and Licence agreement makes eviction and in general, getting the tenant to vacate the house easier. Such agreements always indicate permission to occupy another’s person’s property and never rights. No property rights are created in the favour of the lessee. No transfer of interest occurs. Keeps the Rent Control Acts away as this cannot be considered as tenancy. It falls under the Indian Contract Act. Real estate market has always been considered as complex and tricky, with transactions that see parties involved often putting their lifetime’s hard earned money at stake. With several complicated deeds being thrown around, the layman has always been timid about venturing into the legal side of it. The last few years saw the real estate market undergoing more than a few changes. The Indian Janata is becoming increasingly aware of the law governing deals and transactions. Eventually, the market saw a shift in the very style in which deeds and agreements were drafted. One of the most common real estate functions, which even simple people like you and me enter into, is renting. In metro cities and cities with high population, renting homes and thereby rental agreements have become a necessity. While everyone agrees that a rental agreement needs to be in place, most do not understand the implications of not having one. As you may already know, a rental deed is a document drafted and signed by the owner of the premise and the tenant who plans to occupy it. The document, in length, discusses the monthly rent and various other charges. Essentially, this document transfers the right to enjoy a property from its owner, to a tenant, for a fixed period of time and for a fixed amount of money. What if an owner does not wish to transfer the interest of the property to his tenant? What if the tenant refuses to vacate? Indian law states that as long as a tenant is regular about paying rent and other charges, you cannot simply evict him for a period of 5 years, unless he/she commits something that breaches the agreement. And so the Leave and Licence agreement comes into picture. This agreement, often used as a replacement for the good old rental agreement is now frequently used in cities like Mumbai. Leave and Licence agreement is a safer option for the landlord, say experts. Unlike a rental agreement, the Leave and Licence agreement does not transfer the right of enjoyment of property to the tenant. It is a Licence given by the property owner termed as Licensor to the Licensee to use the property for a certain period of time under some terms and conditions, without creating any landlord-tenant relationship. Throughout the duration of the contract, the right of possession remains with the owner. By definition, its a document that provides someone with the right to do or continue to do something within an immovable property. No transfer of interest of property is created, it simply provides the right to enjoy a property for a short term while the landlord maintains full interest. The Leave and Licence agreement sets up a more relaxed owner-tenant relationship as compared to the regular rental deed. In places like Mumbai they are widely used as an alternative to leases and similar documents. However, if you are a tenant who feels that this is not your cup of tea, feel free to go through our pre-drafted, ready to use rental agreement. It is a comprehensive document that covers both tenant and landlord.